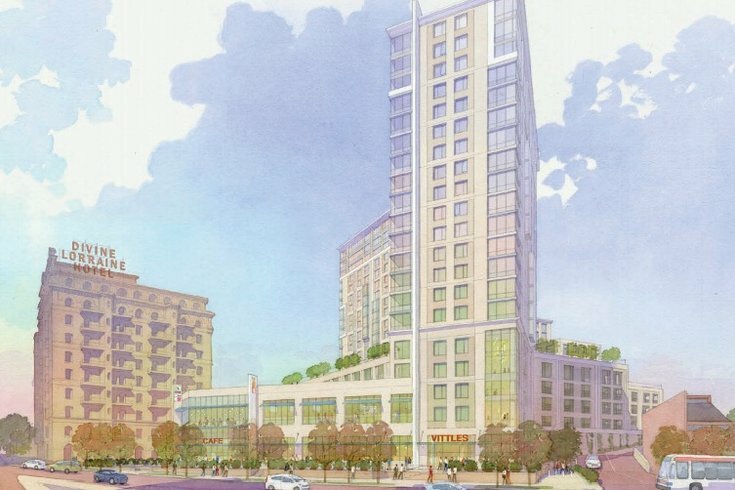 A rendering of the upcoming 1300 Fairmount mixed-use project. The new building will include rental apartments and an Aldi grocery store. An upcoming mixed-use project near the Divine Lorraine, currently known only as 1300 Fairmount, is finally breaking ground Thursday after years of planning. The project, spearheaded by RAL Cos. & Affiliates, will include 478 new rental apartments and 60,000 square feet of retail. A new Aldi was recently announced to take up 25,427 of that square footage. In total, 1300 Fairmount will be 14 stories high and span 624,575 square feet. The project is estimated to cost $190 million. Though the developer RAL is based in New York, a Philadelphia-based company, Cope Linder Associates, was selected to design the building. Thursday afternoon, Mayor Jim Kenney, along with Council President Darrell Clarke, the 14th Democratic Ward, Suffolk Construction Company, and RAL will be onsite for a ceremonial groundbreaking. Rentals at 1300 Fairmount will range from studios to three-bedroom apartments. In addition to the Aldi, RAL has leased 12,488 square feet to Nobel Learning Communities, Inc. for a Chesterbrook Academy Preschool location. The groundbreaking has been about two years in the making. In 2016, developers received a $2 million state grant and a city permit to deal with the site's former storage tank. Check out some other possible property highlights here. Construction of 1300 Fairmount is expected to finish in 2020.